SYRACUSE, N.Y. (AP) — After Syracuse defeated Louisville in the home season finale Friday night, Orange coach Dino Babers brought the seniors out of the locker room to mingle one last time with their fans inside the Carrier Dome. Quarterback Eric Dungey lingered longer than most, snapping selfie after selfie with fans. It was a moment to savor for one of the most dynamic players in school history as No. 12 Syracuse (8-2, 5-2 ACC) continued its return to respectability under the leadership of its third-year coach and his star quarterback. That skinny kid who was thrust into the season opener his freshman year when senior Terrel Hunt suffered a career-ending injury, then delivered a victory in his first college start the next week, has overcome at least one concussion and a broken foot to flourish at Syracuse. Dungey holds or shares 16 team records — from passing yards per game in a season (297.7) to career 300-yard passing games (10) to total offense per game for a season (330.2) and career (294.3) to most rushing yards in a game by a quarterback (200). He has 10,594 total yards, fifth all-time in the ACC, and needs just 71 yards rushing to reach 2,000 for his career. “I think it’s the confidence I have in myself,” said Dungey, who starred at Lakeridge High School outside Portland, Oregon, but had few college suitors. “I was under-recruited. Our confidence wasn’t as high as it should have been. Those records have been achieved despite long absences due to injury by a player who has uncanny physical ability as a runner that’s allowed him to hurdle over defenders . Or better yet, now that he’s a 226-pound tower of muscle, run over them. That broken foot happened last fall early in Syracuse’s game at Florida State . It didn’t prevent Dungey from finishing the game and nearly leading the Orange to victory. His line: 24 completions for two touchdowns and 109 yards rushing and another score in a three-point loss. To be sure, the injuries have been a major hindrance for the team because they’ve kept Dungey on the sideline for 10 entire games and most of another. 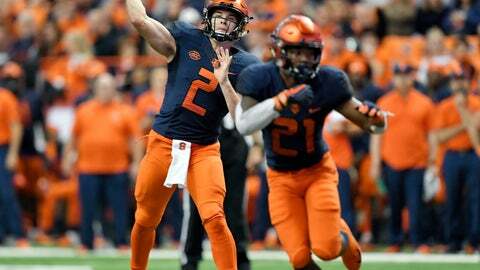 In between, he’s guided Syracuse to stunning home victories over Virginia Tech and Clemson , and two weeks ago he outdueled North Carolina State star Ryan Finley in a 51-41 victory over the No. 22 Wolfpack. Dungey’s final season has been injury-free. He’s adapted his style, often sliding to safety instead of confronting tacklers head-on, and the high-powered offense has purred for the most part, averaging 44 points a game. But it has not been without its trials. The broken foot opened a window for redshirt freshman backup Tommy DeVito to strut his stuff, and he has developed rapidly, taking first-string snaps in spring ball while Dungey was on the mend and mounting a challenge in preseason camp. That experience has paid big dividends for the Orange. When Dungey faltered late and the Orange fell behind North Carolina three weeks ago, DeVito replaced him and led Syracuse to an overtime win as Dungey cheered from the sideline. DeVito also starred in a win over Florida State when Dungey had to sit because of blurred vision caused by a fragment from the artificial turf field. Now Dungey is poised for perhaps the biggest game of his career. The Orange face No. 3 Notre Dame (10-0) at Yankee Stadium on Saturday as the Irish chase a spot in the College Football Playoff. No matter the outcome, the story of the likable kid from the West Coast, whose off-the-field antics included backflips off 20-foot ledges and plunges from 75-foot towers into the Willamette River, won’t soon be forgotten.